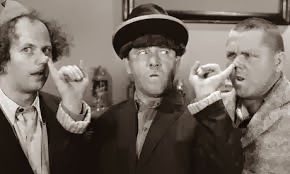 Original Pechanga's Blog: Three Chukchansi Leaders Act Like THREE STOOGES. WHICH ONE IS MOE? Three Chukchansi Leaders Act Like THREE STOOGES. WHICH ONE IS MOE? The FRESNO BEE continues to shine the spotlight on the corruption and infighting at Chukchansi. It's amazing that the three so-called "leaders" can't see how stupid they are. How does that dead golden goose taste? Like it has bedbugs in it? Nancy AYALA is accusing Lewis of TREASON against the tribe now. Really, you stupid idiot? And you were part of the faction that destroyed your own tribe? Nancy is not smart enough to be LARRY.... so can we call her Curly? Lewis, Ayala and Reid, Which one is MOE? The three leaders vying for control of the Picayune Rancheria of Chukchansi Indians — and its $9 million-a-month haul from its Madera County casino — have undeniably different styles. Reggie Lewis, 62, conducts business from a high-rent, north Fresno office that has a sweeping view of the San Joaquin River. He has control of the tribe's multimillion-dollar bank accounts. Nancy Ayala, 46, holds meetings in a windowless portable building near the tribe's Chukchansi Gold Resort & Casino, which opened in 2003 along Highway 41 near Coarsegold. Ayala controls the daily casino profits, which she no longer deposits in the tribe's bank accounts for Lewis to use. Morris Reid, 72, keeps tabs on the tribe from his Fresno home near Saint Agnes Medical Center. He has neither access to the bank accounts nor the casino profits. While all three agree that in-fighting is bad for business, none of them are willing to step aside. The power struggle has led to charges — and counter charges — of embezzlement that, in Ayala's estimation, will put the casino in bankruptcy within a year if the leadership issue isn't resolved. Now, Lewis has upped the ante, said Ayala, who described the dispute as "a chess match." For years, Lewis opposed the North Fork Rancheria Band of Mono Indians' plan to put a swanky casino resort along Highway 99 north of Madera because it would cut into the Chukchansi tribe's profits. As recently as May, Lewis sent out a newsletter to tribal members voicing his opposition. But now, Ayala said, he is trying to cut a deal with the North Fork tribe "for his own personal gain." "He's a traitor. He's not only selling out his mother, he is selling out the entire tribe," she said. I feel bad for morris.. I mean I really do. I know he had his 2 terms, I still think something doesn't set well. All this Making a lot of us sad. Do not feel bad for ANY existing tribal member.